One of those pans we use all the time at the cooking school - perfect for use in a woodfired oven as a casserole but also using the lid as a grill pan. The best quality as ever from our friends at Morso. 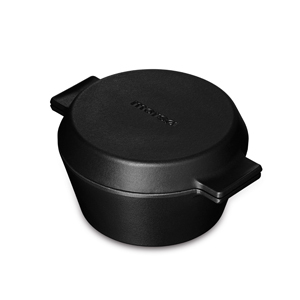 A fantastic quality cast iron casserole with the added bonus of a lid you can use as a grill pan. An investment piece but one we use time and again at the cooking school - it justs gets better. a big old pan - it will take 3 litres.